In 2002, we set sail on our mission with 10 wonderful and committed volunteers. Today we have over 300 per week. The synergy between our volunteers and the kids makes for a remarkable experience. New peer friendships and mentoring relationships are forged every day. In view of our united purpose, everyone’s troubles and struggles seem to be suspended for a time – a respite for all. There is a lot of hard work to be done and heart wrenching moments to be sure, but for countless volunteers, Storybook has proven a life changing experience. 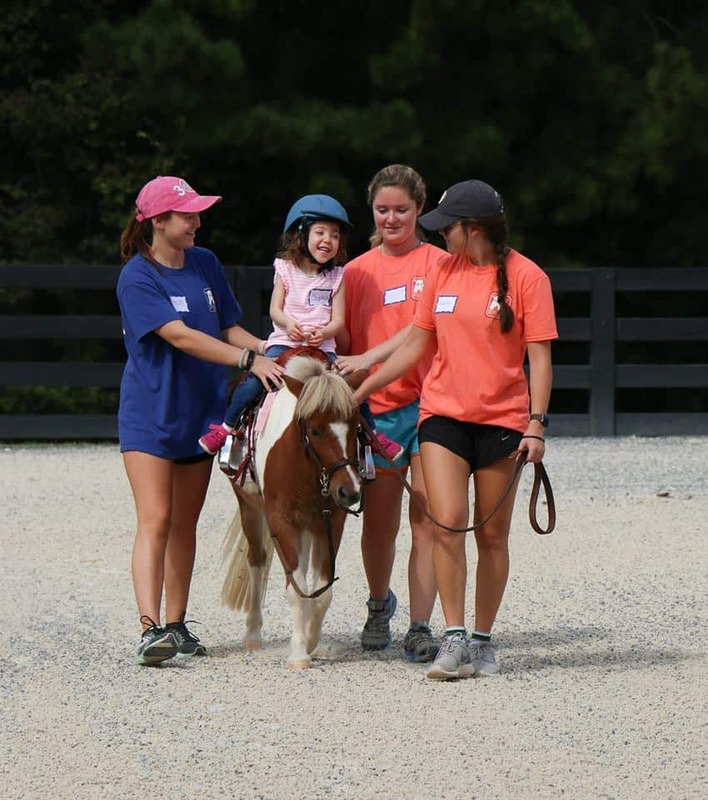 Storybook is a beautiful 25 acre farm located in Opelika, Al, approximately 20 minutes from the Auburn campus. 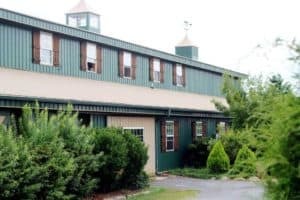 For those enamored of horses, for those enamored with the beauty of nature or simply enjoy the outdoors, or for those looking to impact the lives of some remarkably courageous children, Storybook Farm is a magical place. The synergy between our volunteers and the kids makes for a remarkable experience. New peer friendships and mentoring relationships are forged every day. In view of our united purpose, everyone’s troubles and struggles seem to be suspended for a time – a respite for all. 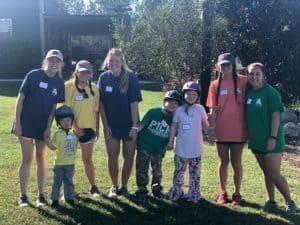 There is a lot of hard work to be done and heart wrenching moments to be sure, but for countless volunteers, Storybook has proven a life changing experience.Storybook is a beautiful 25 acre farm located in Opelika, Al, approximately 20 minutes from the Auburn campus. 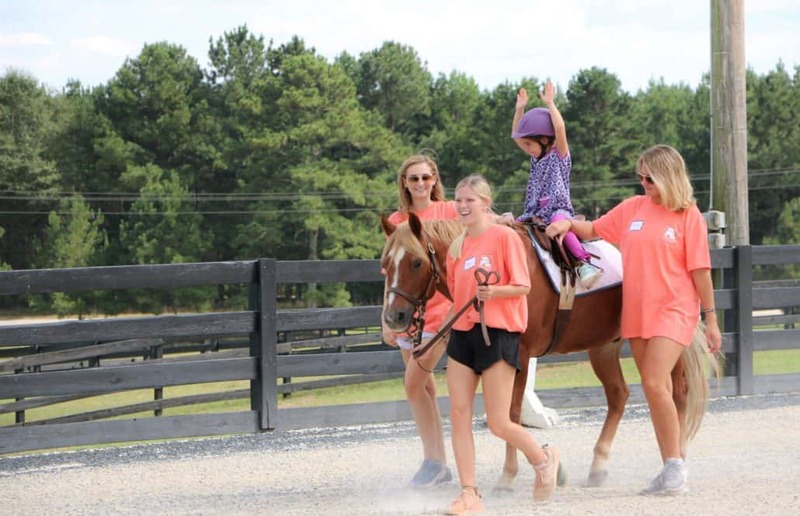 For those enamored of horses, for those enamored with the beauty of nature or simply enjoy the outdoors, or for those looking to impact the lives of some remarkably courageous children, Storybook Farm is a magical place. 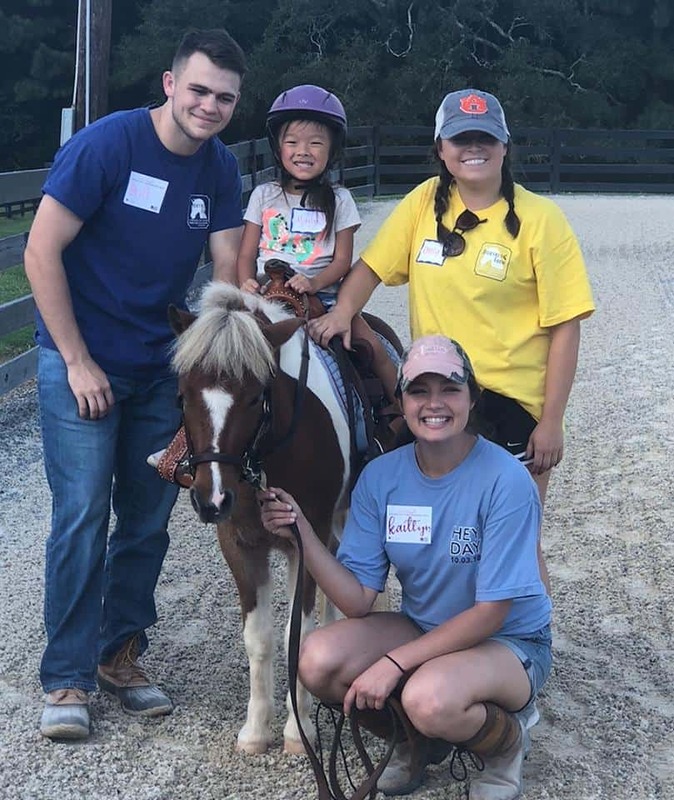 Volunteers are the heart and soul of Storybook Farm. Their energy, commitment to our mission and unwavering sense of hope for each and every child is the essence of Storybook. We hope you will join our mission! Sessions are held year round (spring, summer and fall). You must be 15 years or older to work alongside our riders. Please plan to commit to an average of 10 weeks of consistent weekly volunteer time. Literally walk alongside our riders and their horses and bear witness to tiny miracles happening each week. 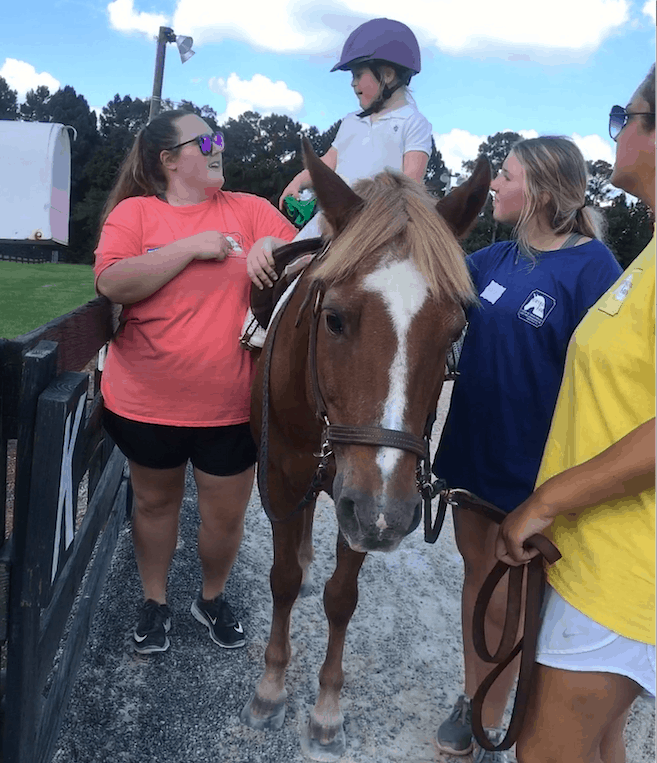 A mandatory training program is required annually, which includes information regarding SBF’s mission, horse care and management, safety precautions, the process of therapeutic riding, and specific information regarding children facing life challenges. 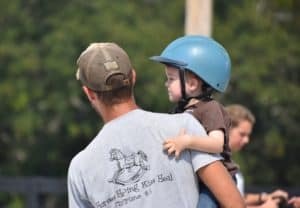 Volunteer to assist with non-riding activities and barn maintenance. 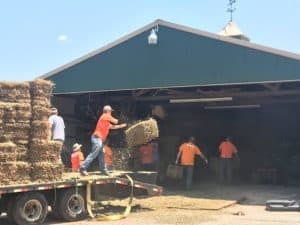 Barn maintenance includes essential tasks such as cleaning pastures, filling water buckets, grooming horses, cleaning tack, small repairs to prepping arts and craft activities. Your hard work benefits each rider, family and animal that calls Storybook home! Participate as part of a group (e.g. school or civic organization) in a prearranged work activity or field trip. Coordination of programming and scheduling is handled by group leaders. SBF’s staff and volunteers are blessed to welcome dozens of work groups to the Farm each year. All skill sets (from construction to cleaning) are beneficial to our ministry! Email sem0049@auburn.edu for information on joining.